After the bag here’s the shoe… na mawi-windang ka sa presyo … now I know where have all the Africa’s diamond gone, are women really this sucker of fashion? Or the designers? …Often its not the women who demands, it’s the industry that make use of women …that would be another story. Double wow for this Borgezie Diamond Stilleto, this shoe was made to last forever…. Dyos ko kelangan ko ng PSG nito… biro mu, this is made of pure gold, encrusted with 2,200 diamonds …. The heart shaped sole can be replaced when it would show signs of wearing out… dapat lang! And priced at $150,000.00 so sa pera ng Pinas mga roughly 7 million pesos lang naman… mura…waaaaaaaaaahhhh! Want a pair?… maybe I should sell my M…L first … this is to die for …lol.. 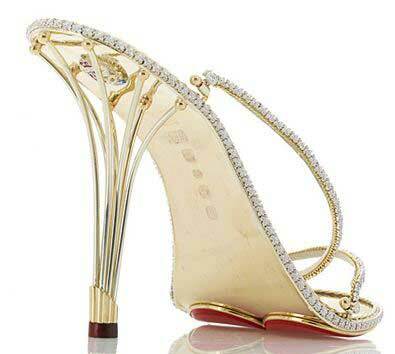 The shoes would look so ordinary without those diamonds. Kahit magkaroon ako ng billions, hindi ako bibili. Grabe! Para Sapatos lang. It's too ostentatious! I wanna be a billionaire... haha! Sis, I have passed a blogger Award for you. pls check it out! ouch in my dreams ulit to wear that stilleto, call Madam Imelda to lend me some of her shoes na lang, lol..thanks sa visit and comment..
agoy ginoo...d ko ani palit woi...matulis man ta ani...ehhehehe!